(C) 2012 Monica A. Farfan. This is an open access article distributed under the terms of the Creative Commons Attribution License 3.0 (CC-BY), which permits unrestricted use, distribution, and reproduction in any medium, provided the original author and source are credited. Introduced millipede species in the family Julidae are common in the U.S. but little is known about how they interact with other organisms, such as mites. To start to determine the nature of the relationship, millipedes were sampled from across the eastern U.S.A. and the United Kingdom in 2008–2009. Sixteen morphospecies of mites (Acari: Astigmata, Mesostigmata) were collected from these millipedes, 12 of which from a total of 13 species of julid millipedes. None of these 12 species was restricted to a single host species. However, 12 of the 16 mite species collected were restricted to either the U.S.A. or the U.K. These results are consistent with locality, rather than host, specificity. Mites evolved relationships with other arthropods between 100–300 million years ago with the diversification of both plants and arthropods in the late Mesozoic era (Southwood 1973). As more niches became available mites developed a wide variety of well-known symbiotic relationships with many arthropods (Lindquist 1975) including many species of myriapods (Maes 1983; Southcott 1987; Bloszyk et al. 2006), especially members of the class Diplopoda, the millipedes. Notably, most available studies are limited to large mites associated with relatively large, tropical species of millipedes (generally length > 3 cm). Most of these mites belong to the suborder Mesostigmata (Table 1). Second, with some exceptions (Lawrence 1939a; Evans and Sheals 1959; Kethley 1978; Ishikawa 1986; Fain 1988; Gu et al. 1991; Fain 1994; Gerdeman and Klompen 2003; Uppstrom and Klompen 2005), most studies do not report a precise identification of the millipede host (even at the generic or familial level). This, of course, makes it difficult to recollect these species or to study their ecological relationships. 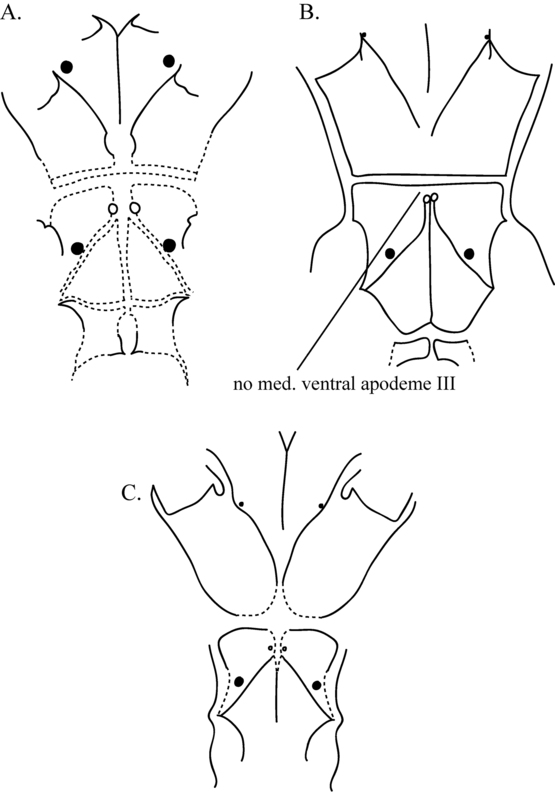 Literature records of mesostigmatid mites (Acari: Mesostigmata) associated with Diplopoda. Host names are given as in the original references. Most mites associated with small millipedes (length < 3 cm) are not Mesostigmata, but belong to the cohort Astigmata. Reported associations of astigmatid mite and millipedes are shown in Table 2. The relationships between astigmatid mites and small millipedes are suspected to be commensalistic (OConnor 2009) although little experimentation has been done to discern the exact nature of the relationship. 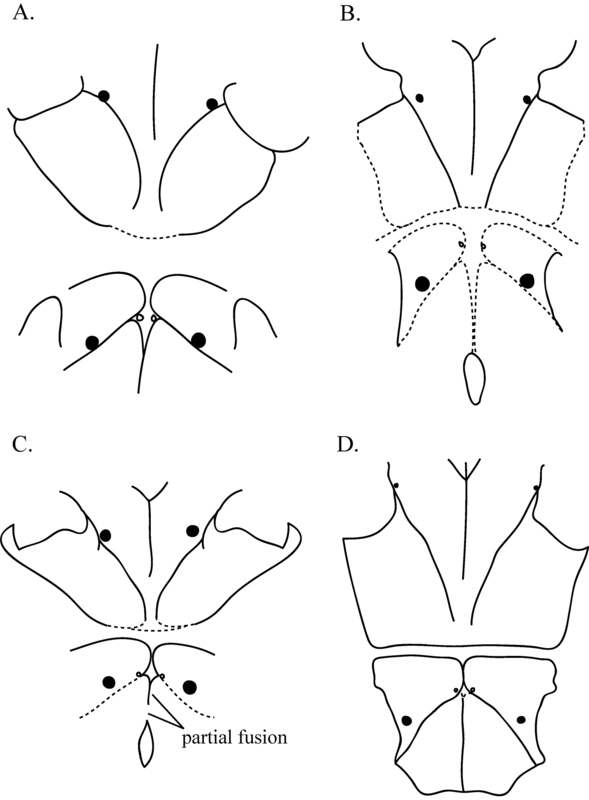 The cohort Astigmata is characterized by having the second of the three ancestral nymphal instars, the deutonymph, highly modified for dispersal (the hypopus stage) (OConnor 2009). 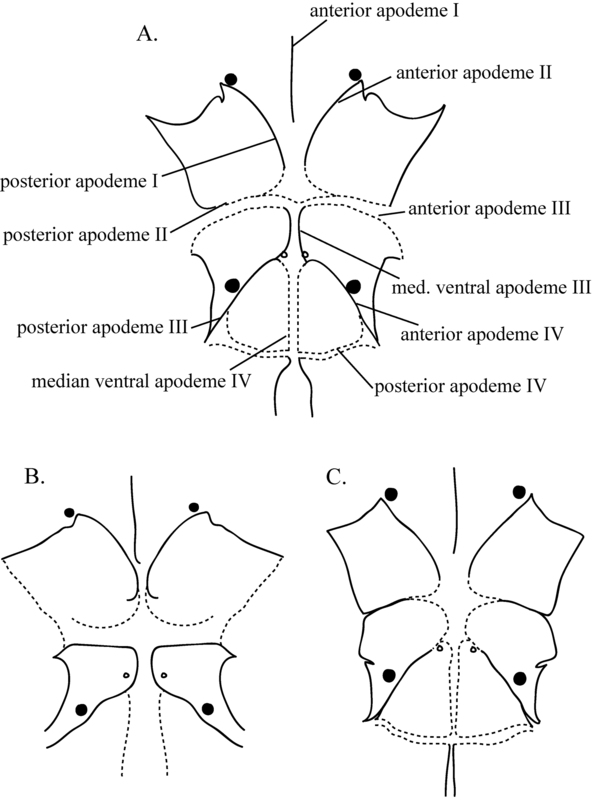 This instar is characterized by the absence of a mouth, a very flat venter and convex dorsum, strong sclerotization of both dorsum and venter, and modification of a number of posterior setae into a postero-ventral attachment organ. The astigmatid deutonymph is considered to be one of the best examples of a phoretic adaptation. A thorough definition of phoresy in mites is given in Houck and OConnor (1991). In broad terms, the deutonymph is a way for phoretic species to disperse from a suboptimal environment which it may not be able to escape on its own. Literature reports of astigmatid mites (Acari: Astigmata) associated with Diplopoda. Host names are given as in the original references. The focal taxon for this study are millipedes in the family Julidae. These millipedes, are relatively small (20–40mm), are primarily distributed in the Palaearctic region, and are now found in a variety of anthropogenic habitats in temperate regions. They have also been recorded from many countries in Europe and from Canada, the Tristan da Cunha Island group in the Atlantic Ocean, Mexico, Chile, Peru, New Zealand, South Africa, and Antarctica (Blower 1985). Currently, there are 19 species known from the U.K. (Blower 1985) and 10 from the U.S. (Hoffman 1999). They are assumed to be introduced to the New World from Europe by the deposition of ballast as part of colonial-era shipping (Lindroth 1957; Blower 1985; Shear 1999). Currently, julid millipedes are found in a wide variety of man-made habitats such as residential gardens and parks. Dispersal of these millipedes within North America was, and probably continues to be, mainly through landscape management and transport of plants by humans. This history makes them an ideal test group for examining the effects of recent long range dispersal and possible founder effects. 1. What species are present across the eastern U.S.? 2. What mites are associated with these species? 3. Are there strong indications of host and /or locality specificity? Host specificity in relationships between the millipedes in the family Julidae and the phoretic mite would be indicated if particular mite species are consistently associated with specific millipede host species. If mites are host specific and there was a founder effect during colonization of the New World, diversity of specific mites in the U.S. is likely to be less than in Europe. Alternately, the presence of mites on a millipede may be based on locality, not host, specificity. This assumes that mites are specific to a certain area or type of off-host habitat. In this case a wide range of hosts occurring in the preferred habitat/locality might be suitable as phoretic host. Predictions for the locality hypothesis are (1) individual mite species will be present on a number of different millipede host species but restricted to certain collection localities; (2) ‘American’, not European, mites will be present on U.S. representatives of European millipede species, and (3) there will be similar mite diversity on U.S. and European populations of the same millipede species. Millipede specimens were collected from localities in the eastern United States from March through October in 2008 and 2009 and in the United Kingdom in April 2009. Sites in the U.S.A. were chosen to include geographic diversity and to include a number of cities used as colonial ports. While known to be found near such port cities, the current range of julid millipedes is more extensive. Millipedes were collected by hand except in one instance (Whetstone Park, Columbus, OH) where litter was returned to the Ohio State University Acarology Laboratory (OSAL) for extraction by Berlese funnel. Hand collection was done from wood mulch, leaf litter, and soil. Much collecting was done at the soil/litter interface. Millipedes (with mites associates attached) were collected and placed individually into 1.5 mL vials containing 95% ethanol. Mites release their hold on immersion in alcohol, so individual host preservation is essential. Millipede and mite specimens used in this study are deposited at OSAL. Voucher numbers for representatives of all millipede host species and mite morphospecies, as well as species citations, are listed in Appendices 1 and 2. Millipedes were dissected and, in some cases, genitalia were slide mounted. Specimens were identified using the following keys: Blower (1985), Shear (unpublished key), and Shelley (1978, 1988, 2002). Hoffman’s checklist (1999) was used as a reference for regional distributions. Mites were sorted to morphospecies using a 12–110× Nikon SMZ dissecting microscope, and some individuals from each morphospecies (including a diversity of hosts and/or sites) were slide-mounted for final identification using a Zeiss Axioskop compound microscope at magnifications up to 1000×. Overall, 148 mites, approximately 11% of total mites collected, were slide mounted. Astigmatid mites were identified to genus using keys by OConnor (unpublished). Specific identification proved impossible as most mite species collected appear to be undescribed. Full description of these mites is beyond the scope of this study, but we do provide some of the characters on which discrimination into morphospecies was based. This should allow evaluation of the validity of those morphospecies concepts. Prevalence of the identified mites was calculated for each host species and each locality. Prevalence is defined as: (number of hosts with a particular parasite species) / (number of hosts examined) (Margolis et al. 1982). Higher prevalence results from finding a high number of hosts that were examined are found to be carrying a parasite, or phoretic, species. Additionally, the intensity (average mites per infested host) for each host species was calculated (Margolis et al. 1982). Because not all mites were mounted for identification, prevalence calculations are imperfect. A relatively high percentage of associated mites was mounted for hosts collected < 20 times, and prevalence calculations for those hosts are relatively accurate, but these numbers are minimum estimates for millipedes species where N > 20. Twenty three species of millipedes were collected representing 9 different families (Table 3). Thirteen of these species belong to the family Julidae, the focus of this study. Six were collected in large numbers (> 100); Brachyiulus pusillus, Cylindroiulus caeruleocinctus, Cylindroiulus latestriatus, Cylindroiulus punctatus, Cylindroiulus truncorum, and Ophyiulus pilosus. Millipedes in the remaining 8 families (Abacionidae, Blaniulidae, Cleidogonidae, Euryuridae, Glomeridae, Parajulidae, Polydesmidae, and Spirobolellidae), with the exception of Blaniulidae, were collected in relatively low numbers. Intensity (over all mite morphospecies) and prevalence (percentage by mite morphospecies) for mites associated with millipedes examined. Representatives of 6 genera of mites were associated with millipedes collected in this study. These mites belong to two families in the cohort Astigmata; Acaridae and Histiostomatidae, and two families in the suborder Mesostigmata; Laelapidae and Uropodidae. The astigmatid mites represented 13 morphospecies: Rhizoglyphus A and B (Figure 1a and 1c, respectively), Sancassania A and B (Figure 1b), Schwiebea A, C, D, E (Figures 2a, 2b, 2c, & 2d, respectively), F, G, and H (Figures 3a, 3b, & 3c, respectively), Thyreophagus (all Acaridae), and Histiostoma (Histiostomatidae). Specimens of Rhizoglyphus, Sancassania, and Schwiebea were separated into morphospecies by the shape and amount of fusion of the apodemes and the shape of the coxal fields on the venter. These characteristics were chosen because these features are unlikely to be artifacts of the slide-mounting process. The differences between the species can be subtle. Distinguishing characteristics of the morphospecies within the genera Rhizoglyphus, Sancassania, and Schwiebea are detailed in Table 4, and Figures 1–3. Figures show conoidal setae as filled-in circles and simple setae as open circles. The size of the filled-in circles in the diagram is indicative of the relative size of the conoidal setae. Broken lines indicate edges of apodemes with a greater degree of fusion. These edges appear not as distinct or “heavy” as non-fused apodemes. Apodemes and coxal fields are denoted with Roman numerals corresponding with the leg pair they are associates with (e.g., coxal fields II correspond with legs II). Diagram of the coxal fields and coxal apodemes of a Rhizoglyphus A b Rhizoglyphus B and c Sancassania B. Diagram of the coxal fields and coxal apodemes of a Schwiebea A b Schwiebea C c Schwiebea D and d Schwiebea E.
Diagram of the coxal fields and coxal apodemes of a Schwiebea F b Schwiebea G and c Schwiebea H.
Comparative characters for Schwiebea (Acari, Astigmata, Acaridae) species associated with millipedes (Diplopoda). Mites in the families Laelapidae and Uropodidae were determined to genus. Two genera of laelapids were identified as Cosmolaelaps and Holostaspis, the uropodid as Phaulodinychus. Nearly all mite specimens collected from julid millipedes were astigmatid deutonymphs. Morphospecies of Schwiebea were the most commonly collected from these millipedes (Table 3). Rhizoglyphus A was collected from the highest number of julid species in this study (n = 9). This was followed by Histiostoma sp. (n = 6). Thyreophagus specimens were found on Ommatoiulus sabulosus and Cylindroiulus britannicus only. Schwiebea D, E, and G and Phaulodinychus sp. were also collected from one julid host species only. Phaulodinychus sp. was collected only once on a julid millipede, Cylindroiulus latestriatus. There were no laelapid mites collected from julid millipedes. Cylindroiulus caeruleocinctus had five species of mite associates which was the highest diversity among julids. Tachypodoiulus niger and Ommatoiulus sabulosus had the fewest associate species (one species each). Prevalences were found to range from 0.27%–50.0% (minimum estimates). Notable are the associations of Schwiebea H on Tachypodoiulus niger (N=2), and Rhizoglyphus A and Histiostoma sp. on Cylindroiulus londinensis (N= 2), each with the highest prevalence of 50.0%. The lowest prevalence was calculated for Rhizoglyphus Aon Ommatoiulus pilosus (0.27%) (but see comments in Material and Methods). Intensity also tends to be low. The average intensities for the six most common julid species ranged from 1.66–3.32 mites per host with an average of 2.43. This is probably close to the average intensity for all Julidae. Schwiebea C was collected from the highest number of non-julid hosts (n = 5). Polydesmus angustus was associated with 4 morphospecies of Schwiebea, all collected from one host individual. Histiostoma sp. and three species of Schwiebea have been collected from the combined specimens in the family Blaniulidae. The two taxa collected from Uroblaniulus carolinenesis and Paraspirobolus lucifugus were Histiostoma sp. and Schwiebea C. Abacion lactarium was the only species, julid or non-julid, to have Rhizoglyphus B as an associate. The euryurid Euryurus leachii was the only millipede host to have mite associates in the family Laelapidae. Representatives of two genera, Cosmolaelaps and Holostaspis, were collected. Consistent with the general association pattern of Laelapidae, these mites were collected as adults, not deutonymphs. Additionally, a considerable number of deutonymphs of the uropodine Phaulodinychus sp. were collected from this millipede. Euryurus leachii was the millipede with the highest intensity (11.27) and the largest number of mite species among the non-julids with five mite morphospecies. The prevalence of mites found on non-julid millipedes was generally high. This may be associated with the fact that the numbers of non-julids collected were relatively low, with the exception of blaniulids. For example, 50.0% of the Glomeris marginata (N = 4) carried Schwiebea E. Blaniulids were collected most commonly, and showed prevalences between 0.94–3.77% for their mite associates Schwiebea D, E, and F, and Histiostoma sp. Only four mite species were collected from localities in both the U.S.A. and in the U.K., Rhizoglyphus A, Schwiebea C, Schwiebea F, and Histiostoma sp. (Table 5). Mite taxa that were found exclusively in the U.S.A. are Rhizoglyphus B, Sancassania A, Sancassania B, Schwiebea D, Cosmoglyphus sp., Holostapis sp. and Phaulodinychus sp. Taxa found only in the U.K. Schwiebea A, Schwiebea E, Schwiebea G, Schwiebea H, and Thyreophagus sp. The highest diversity of mite taxa by locality was found in Cornwall, U.K. Only one mite taxon each was collected in Chicago, IL, Columbus, OH, and Lakewood, OH. Prevalence (percentage) of mites on millipedes (all species combined) by collecting locality. Of the seven millipede species collected in both the U.S.A. and the U.K. only Cylindroiulus caeruleocinctus had the same mite associates in both countries, Rhizoglyphus A and Histiostoma sp. (Table 5). Mite associates of the other six species of millipedes did not appear in both countries on the same julid host species. The current study does not suggest strong host specificity of mite species for julid hosts. The only species that were collected from only one host, Rhizoglyphus B, Cosmolaelaps sp. and Holostaspis sp. are rare, and (so far) exclusively associated with non-julid hosts. This result supports the view of OConnor (1998) who noted that acarids are (1) often associates of a wide variety of hosts and (2) are often cosmopolitan. There is precedent for this in terms of millipede-associated Mesostigmata. While most Heterozerconidae are associated with large millipedes, one genus, Amheterozercon (Fain 1989), is associated with snakes and amphisbaenids (Flechtmann and Johnston 1990). Similarly, most Paramegistidae are associates of carabid beetles or millipedes, except for the genus Ophiomegistus (Banks 1914) which is associated with skinks and snakes (Klompen and Austin 2005). These records suggest that these mites may favor a host with a specific type of locomotion, general distance from the ground, or habitat preference, at best a modified host specificity. Neither is there strong overlap of the mite fauna of specific julid millipedes collected both in the U.S.A. and the U.K., another prediction of the host specificity hypothesis. Only one millipede species (Cosmolaelaps caeruleocinctus) carried the same mite species in both the U.S.A. and the U.K. In a comparison of mite associates found on millipedes and the locality in which they were found (Table 5), 12 of the 16 taxa were collected in either the U.S.A. or the U.K. Only four were collected from both countries. This is an indication that the mites are most likely not associated with specific hosts but, instead, are favoring hosts associated with specific habitats. An unusual finding regarding mite associates was the collection of a species in the genus Thyreophagus collected in the U. K. Past reports of Thyreophagus sp. are mostly from the U.S.A. Thyreophagus is a mite thought to be associated only with subcortical insects (OConnor 1982) with often high host specificity (OConnor 1984). This is very different from the lifestyles of the other acarids collected in this study that seem to be very general in their host choice. Ommatoiulus sabulosus and Cylindroiulus britannicus were the hosts of this mite. They were collected from an outdoor garden and a greenhouse/conservatory in Cornwall, U.K., sites which were a good distance from each other. A further survey of ground arthropods in Cornwall could help clarify the degree of specificity of this genus in the area. Thanks to Helen J. Read, and the British Myriapod and Isopod Group for their help in the collection of specimens, and to Barry OConnor for permission to use his unpublished keys to Astigmatid genera. Thanks to John W. Wenzel, currently Carnegie Mellon University, and Andrew P. Michel, OSU Department of Entomology, for their kind review of earlier drafts of this publication. Baker MR, Seeman OD (2008) Mites and millipedes: a new Neomegistus (Acari: Mesostigmata: Paramegistidae) from Australia. Systematic and Applied Acarology 13(3–4): 204-213. Berlese A (1916) Centuria prima di Acari nuovi. Redia 12: 31-32. Bloszyk J, Klimczak J, Lesniewska M (2006) Phoretic relationships between Uropodina (Acari: Mesostigmata) and centipedes (Chilopoda) as an example of evolutionary adaptation of mites to temporary microhabitats. European Journal of Entomology 103 (3): 699-707. Blower JG (1985) Millipedes: Keys and notes for the identification of the species. E. J. Brill/Dr. W. Backhuys, London, 242 pp. Canestrini G (1888) Intorno ad alcuni Acari ed Opilionidi dell America. Atti della Società Veneto-Trentina di Scienze Naturali 11 (1): 100-111. Casanueva ME, Johnston DE (1992) Systematic studies on Jacobsonia (Acari, Mesostigmata), a mite associated with Indo-Malaysian millipedes. Boletin de la Sociedad de Biologia de Concepcion 63: 55-63. Eisner T, Alsop D, Hicks K, Meinwald J (1978) Defensive secretions of Millipeds. In:S. Bettini (Ed) Handbook of Experimental Pharmacology: Arthropod Venoms. Springer-Verlag, New York, 41–72. Evans GO, Sheals JG (1959) Three new mesostigmatic mites associated with millipedes in Indonesia. Entomologische Berichten, Amsterdam 19: 107-111. Fain A (1987a) Notes on mites associated with Myriapoda. I. Three new astigmatic mites from Afrotropical Myriapoda (Acari, Astigmata). Bulletin de l’Institut Royal des Sciences Naturelles de Belgique, Entomologie 57: 161-172. Fain A (1987b) Notes on mites associated with Myriapoda: II. Four new species of the genus Julolaelaps Berlese, 1916 (Acari, Laelapidae). Bulletin de l’Institut Royal des Sciences Naturelles de Belgique, Entomologie 57: 203-208. Fain A (1988) Notes on mites associated with Myriapoda. III. Two new species of the genus Heterozercon Berlese, 1888 (Acari, Mesostigmata) from Afrotropical Myriapods. Bulletin et Annales de la Société royale belge d’Entomologie 124: 237-242. Fain A (1989) Notes on mites associated with Myriapoda. IV. New taxa in the Heterozerconidae (Acari, Mesostigmata). Bulletin de l’Institut royal des Sciences Naturelles de Belgique, Entomologie 59: 145-156. Fain A (1992) Notes on mites associated with Myriapoda: V. The genus Scissuralaelaps Womersley, 1945 (Acari, Mesostigmata): Description of four new species from New Guinea. Bulletin de l’Institut Royal des Sciences Naturelles de Belgique, Entomologie 62: 109-116. Fain A (1994) Notes on mites associated with Myriapoda: VI. The genus Jacobsonia Berlese, 1910 (Acari, Laelapidae): Description of four new species from New Guinea. Journal of African Zoology 108: 585-595. Gerdeman BS (2002) The biology of the Heterozerconidae. Columbus, OH, Ohio State University, 105 pp. Gerdeman BS, Garcia R (2010) Heterozerconidae: A comparison between a temperate and a tropical species. Trends in Acarology, Proceedings of the 12th International Congress. Sabelis MW, Bruin J. Dordrecht, Springer Science: 93–96. Gerdeman BS, Klompen H, Tanigoshi L (2000) Insights into the biology of a mite-millipede association. Fragmenta Faunistica, Warszawa Supplement 43: 223-227. Gu Y, Wang C, Li J (1991) A new genus and species of Gamasides off Julus terrestris and a new family proposed (Acari: Dermanyssoidea). Acta Zootaxonomica Sinica 16: 428-431. Hoffman RL (1999) Checklist of the millipeds of North and Middle America. Virginia Museum of Natural History, Martinsville, VA, 581 pp. Hoffman RL, Payne JA (1969) Diplopods as carnivores. Molecular Ecology Resources 50 (6): 1096–1098. Hopkin SP, Read HJ (1992) The Biology of Millipedes. Oxford University Press, Oxford, England, 233 pp. Hunter PE (1993) A new family of mites, Costacaridae (Mesostigmata: Trigynaspida: Celaenopsoidea), associated with millipedes in Mexico. Israel Journal of Zoology 39 (2): 185-191. Ishikawa K (1986) Gamasid mites (Acarina) associated with Japanese millipeds. Reports of Research Matsuyama Shinonome Jr. College 17: 165-177. Ishikawa K (1988) Two new species of Scissurolaelaps (Acarina, Laelapidae) associated with Philippine millipeds. Bulletin of the National Science Museum, Tokyo, Serie A14 (4): 173–178. Kethley JB (1973) Developmental chaetotaxy of a paedomorphic celaenopsoid, Neotenogynium malkini n. g., n. sp. (Acari: Parasitiformes: Neotenogyniidae, n. fam.) associated with millipedes. Annals of the Entomological Society of America 67 (4): 571-579. Kim C, Klompen H (2002) A new genus and species of Paramegistidae (Mesostigmata: Trigynaspida) asociated with millipedes from Mexico. Acarologia, Paris 42 (1): 39-52. Klompen H, Austin CC (2007) A new species of Ophiomegistus Banks (Acari: Paramegistidae) from Papua New Guinea. Zootaxa 1387: 47-57. Kontschan J (2005) Two species of Julolaelaps Berlese, 1916 (Acari : Mesostigmata : Laelapidae) associated with millipedes from Kenya. Annales Historico-Naturales Musei Nationalis Hungarici 97: 257-260. Lindroth CH (1957) The Faunal Connections between Europe and North America. Almqvist & Wiksell, Stockholm, 344 pp. Maes K (1983) Scientific reports of the Belgian Mount Cameroon expedition 1981. VIII. Description of four new species of the genus Julolaelaps (Acarina: Laelapidae). Revue de Zoologie africaines 97 (1): 211-220. Mahunka S (1962) Neue Beiträge zur Kenntnis der einheimischen Acariden-Fauna (Acari). Opuscula Zoologica (Budapest) 4(2–4): 97-103. Mahunka S (1992) New and interesting mites from the Geneva Museum. XXXVII. New mites from the Pacific Islands (Acari: Anoetidae, Scutacaridae). Revue Suisse de Zoologie 99 (2): 395-403. OConnor BM (1994) Life history modifications in astigmatid mites. In: Houck MA (Ed). Mites: Ecological and Evolutionary Analyses of Life-History Patterns. Chapman & Hall, New York: 136-159. OConnor BM (2009) Cohort Astigmata. In: Krantz GW, Walter DE (Eds). A Manual of Acarology. Texas Tech University Press, Lubbock, Texas: 565-658. Oudemans AC (1914) Acarologische Aanteekeningen LII. Entomologische Berichten 4, 65–73. Oudemans AC (1915) Notizen über Acari. XXII. - Archiv für Naturgeschichte 81: 131-134. Pherson DA, Beattie AJ (1979) Fungal loads of invertebrates in beech leaf litter. Revue d Ecologie et de Biologie du Sol 16: 325-335. Salmane I, Telnov D (2007) “Laelaptidae mites (Parasitiformes, Mesostigmata) of east African millipedes (Diplopoda).” Latvijas Entomologs 44: 121. Shear WA. Key to Milliped Families of the Eastern United States. unpublished key. 22 pp. Snider RM (1984) The ecology of Polydesmus inconstans (Diplopoda: Polydesmidae) in Michigan wood lots. Pedobiologia 26: 185-196. Southcott RV (1987) A new larval mite (Acarina: Trombidioidea) ectoparasitic on an Australian centipede, and the Trombidiidae reclassified. Transactions of the royal Society of South Australia 3 (1): 43-52. Southwood TRE (1973) The insect/plant relationship - an evolutionary perspective. In:Van Emden HF (Ed) Insect/Plant Relationships. Halsted Press, London, p. 3–30. Szabo IM, Nasser EGA, Striganova BR, Rakhmo YR, Jäger K, Heydrich M (1992) Interactions among Millipedes (Diplopoda) and their Intestinal Bacteria. Berichte des Naturwissenschaftlich-medizinischen Vereins in Innsbruck, Supplementum 10: 289-296. Trägårdh I (1906) Neue Acariden aus Natal und Zululand. Zoologischer Anzeiger 30 (26): 870-877. Trägårdh I (1907) Description of two myriopodophilous genera of Antennophorinae, with notes on their development and biology. Arkiv för Zoologi 3 (28): 1-35. Trägårdh I (1950) Studies on the Celaenopsidae, Diplogyniidae and Schziogyniidae. Arkiv för Zoologi 1 (25): 361-449. Vitzthum HG (1925) Fauna sumatrensis (Beitrag No. 5) Acarinae. Supplementa Entomologica 11: 37-48. Vitzthum HG (1921) Acarologische Beobachtungen. Archiv für Naturgeschichte 86: 14-22. Walter DE, Krantz GW (2009) Oviposition and Life Stages. In:Krantz GW, Walter DE (Eds) A Manual of Acarology. Texas Tech University Press, Lubbock, Texas, p. 57–63. Womersley H (1956) On some new Acarina-Mesostigmata from Australia, New Zealand and New Guinea. Linnean Society’s Journal-Zoology 42 (No. 288): 505–599. Womersley H (1958) Some Acarina from Australia and New Guinea paraphagic upon millipedes and cockroaches, and on beetles of the family Passalidae. Pt 2. The family Diplogyniidae (Mesostigmata-Trigynaspida). Transactions of the Royal Society of South Australia 81: 13-29. Voucher numbers for millipede hosts. Voucher numbers for associated mite morphospecies.